Cities drive economic growth in high-income countries, creating hubs of innovation and generating an outsized share of national wealth. But, increasingly, we see signs that the benefits of urban economies are not broadly shared among city residents. Income inequalities are on the rise, especially in our largest cities—but such disparities only tell part of the story. Poverty persists despite gains in productivity, and economic mobility appears blocked for many urban residents. Recent protests in cities across high-income countries have drawn attention to these problems, highlighting the structural barriers vulnerable groups face and the instability of the status quo. Underlying these protests is a sense that a growing share of the urban population does not have a fair chance to succeed—that vulnerable groups are being kept out of the jobs, schools, and opportunities they need to move up, leaving them stuck in poverty for years or even for generations. This is more than economic inequality—it’s economic exclusion. And it not only jeopardizes an individual’s chance for success, it also threatens the health, stability, and cohesion of cities and undermines national prosperity. 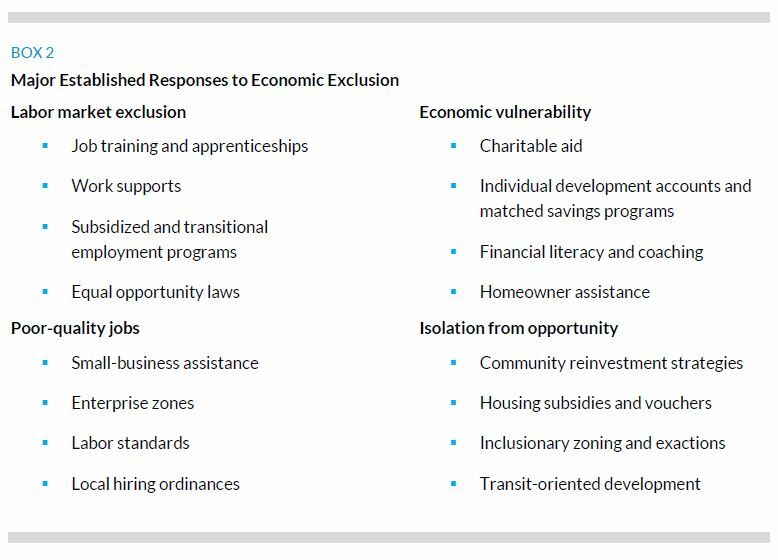 In this brief, we explore what economic exclusion is and describe some strategies that cities have put in place to combat it. City leaders are responding with well-known solutions and innovative new approaches, and they are rethinking the ways they govern around issues of exclusion. We also suggest ways in which information technologies can open up new possibilities for creating more inclusive and open urban economies. Economic exclusion is a multidimensional process in which particular groups are prevented from participating fully and equally in the economic life of their city or metropolitan area. It occurs when people experience acute economic disadvantage over an extended time and results in an inability to improve one’s economic circumstances or enable one’s children to escape them. We use the word “exclusion” to call attention to the actions of private and public institutions and structural forces that perpetuate disadvantage and privilege. Economic exclusion differs from income or wealth inequalities, which can result from and are symptoms of exclusion. Communities of color, immigrants and refugees, and women are particularly affected by exclusion. Labor market exclusion makes it hard to get a job because of discrimination or the changing structure of the labor market. Exclusion from the labor market is likely to increase in the future as employers in the growing knowledge economy seek skills that vulnerable workers do not have. Poor-quality jobs have stagnant low-end wages and unpredictable hours, lack job security, and offer limited-to-no-career pathways. Poor job quality is widespread and growing across high-income countries, and globalization and technological advances may further erode wages and job security at the bottom. Economic vulnerability is exposure to financial risks. Economically vulnerable households lack assets to protect themselves from financial emergencies, such as a job loss or a health crisis. And the social safety nets that should support these households are inadequate or have weakened in recent years. Isolation from opportunity occurs when low-income people and minorities live in neighborhoods without access to jobs, good schools, health care facilities, and public spaces. Economic segregation, where the rich and poor increasingly live in separate neighborhoods, appears to be on the rise in most large cities. These dimensions are distinct and may vary by degree across cities, but they also influence and reinforce each other. For example, stagnant wages and job insecurity (features of poor-quality jobs) make it difficult for families to save money or secure stable housing (features of economic vulnerability). Economic exclusion in cities stems from a deep legacy of disadvantage that continues today. Segregation keeps residents of poor neighborhoods isolated from jobs and deprived of decent housing, schools, and services. Discrimination in housing, employment, and financial services prevents people of color and immigrants from moving up the ladder and improving their lives. Recent trends are reinforcing exclusion and making it more widespread (box 1). After the global recession, many high-income countries slashed public spending, which strained public services, weakened safety nets, and cut public-sector jobs. Growing demand for urban housing, transportation, and services are widening affordability gaps in many cities. In the labor market, many traditional middle-skill jobs have been lost to automation and globalization. By 2020, advanced economies could have a surplus of over 32 million low-skilled workers (Dobbs et al. 2012). In addition, reliance on contingent labor and the so-called “gig economy” is growing fastest in cities, creating new opportunities for self-employment but also shifting risk from employers to workers and decreasing job security and benefits. In Europe and the United States, migration and demographic changes have created competing demands between entitlement spending for an aging population and social spending on an increasingly diverse younger population. Moreover, anti-immigrant sentiment and a growing sense of economic instability are pitting vulnerable groups against each other, a problem that has become particularly acute with the refugee crisis in Europe. What Are Cities Doing to Address Exclusion? Despite these challenges, there is cause for optimism as momentum is building to overcome economic exclusion and improve opportunities for excluded groups. The negative effects of the global recession generated widespread frustration with rising inequalities and broad demand for changes in financial systems. New and influential research has helped reframe exclusion as a problem that hurts economic growth and has consequences for everyone, not just those at the bottom—making it an economic imperative for cities to overcome exclusion (Piketty 2014). Research has also focused attention on the importance of place in shaping life outcomes (Chetty and Hendren 2015). The private sector increasingly recognizes that it has a role to play, and some employers have made moves on their own to improve job quality and access for low-income workers. And across cities in high-income countries, movements and protests opposing exclusion have grown, spurring action. Many city leaders are building off this momentum by doubling down on well-tested solutions, such as apprenticeships to improve workers’ skills and connect them with jobs, subsidies that preserve housing opportunities in gentrifying areas, and enterprise zones that offer tax credits and other benefits to encourage employers to locate in distressed areas (box 2). Some city leaders are going beyond established solutions and experimenting with new approaches, either by choice or necessity. Austerity measures, declining tax bases, and increased demand for services are driving many cities to innovate to make better use of resources and improve efficiency. Some city leaders realize that established solutions typically address only one dimension of exclusion and more comprehensive approaches can have a deeper impact. As a result, outdated bureaucratic structures and strict divides between the public and private sector are giving way to new forms of governance that can address exclusion more efficiently and across its several dimensions. Some cities are developing integrated solutions that are explicitly designed to address jobs, economic security, and the housing needs of excluded groups simultaneously. 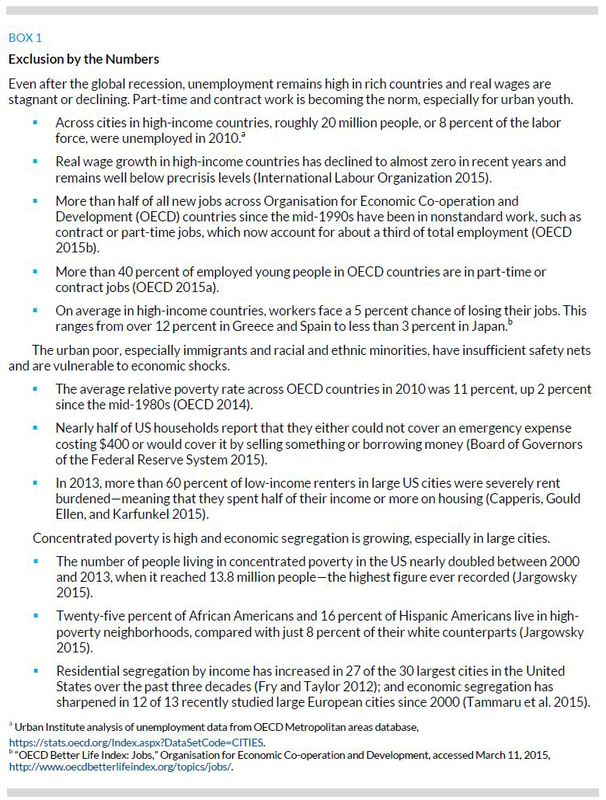 Several cities in the United States, including New York City, Philadelphia, and Richmond, have created antipoverty agencies that coordinate programs, collect better data on social outcomes, and raise supplementary funds from public and private sources to support effective policies.6 In Europe, the Leipzig Charter and Europe 2020 strategy explicitly call for more spatially integrated strategies to reduce poverty and improve economic inclusion. They have also generated new models of interagency, place-based programs, such as the Socially Integrative City in Germany and the politique de la ville in France (Tosics 2015). City leaders are also recognizing that they can no longer afford to assign all or most of the responsibility for addressing poverty, unemployment, low wages, and segregation solely to the public sector, so they are finding creative ways to enable the private sector to play a more robust role in addressing exclusion. Public leaders are actively partnering with the private sector to identify skill needs and help shape training programs or streamline licensing requirements to stimulate small-business creation (Regulatory Reform Team 2015; Spaulding and Martin-Caughey 2015). In the United States, community benefit agreements have linked private real estate development to the housing and employment needs of residents in low-income communities (Musil 2014). Collective impact models, such as the Strive Partnership, bring together public and private stakeholders to support pathways out of poverty and improve student outcomes from “cradle to career” (Grossman and Lombard 2015). How Can Information Technologies Spark Further Innovation? Peer-to-peer technologies can open up job possibilities, enhance social interactions, and reduce costs for transportation, credit, and basic services. Online communities of interest can allow dispersed networks to exchange ideas for innovation, lend money to one another, and organize for change. Peer lending has helped finance everything from small-business development to urban infrastructure. Social media has amplified advocates’ ability to expose corporate abuses and endorse more inclusive labor practices. Big data and crowdsourced data can be tapped to drive efficiency and improve access to opportunities. Some cities are starting to integrate and analyze the wealth of data they have across multiple agencies, such as schools, social services, and the criminal justice system. With these data, cities can better identify excluded people and communities, connect them to needed services, and improve service delivery. Tech-savvy city administrators are relying on mobile technologies and open data platforms to crowdsource information on urban services and planning—from pothole repairs to public safety to disaster response. Likewise, the private sector relies on sophisticated, big data to maximize productivity and profits. This capability could be incredibly powerful if leveraged to maximize a double-bottom line that includes the workers’ well-being and the public good. 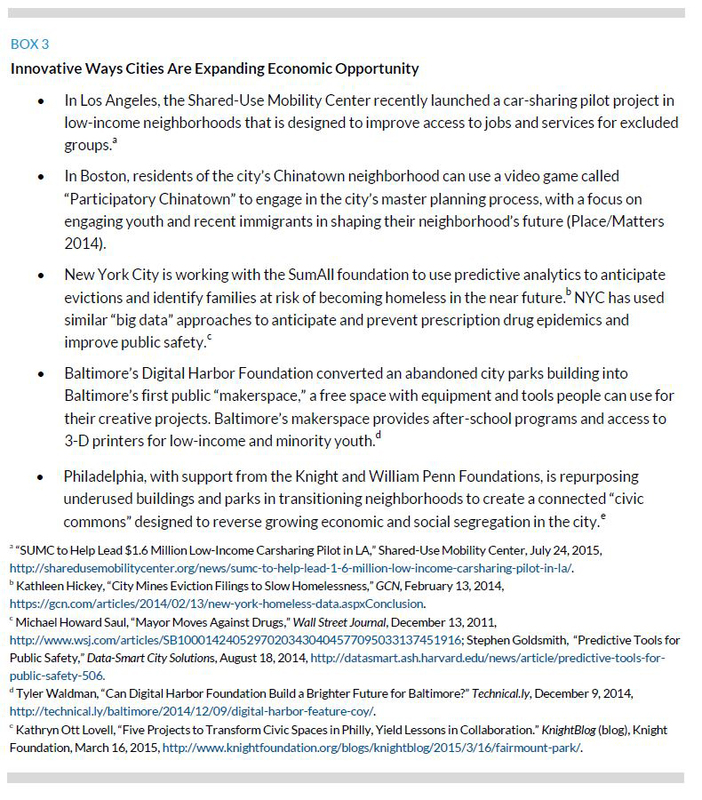 We highlight a few ways cities are beginning to tap into these opportunities in box 3, but much more could be done. In a related series of essays, we will explore how city leaders could channel these features of the information economy to address economic exclusion across its four dimensions. Information technologies and the tools they provide do not themselves generate solutions to economic exclusion in cities; rather, they rely on social movements that continue to push for greater inclusion. Therefore, the most potent applications will be the ones that empower the excluded, generate new evidence about exclusion and its costs to society as a whole, and ease the path that city leaders take toward effective interventions by making better use of existing resources and skills in their communities. Discontent about inequality, wage stagnation, unemployment, and dead-end work has grown in high-income countries since the global recession. That unrest has helped build momentum to address urban inequalities and improve opportunities for excluded groups. In addition to putting established solutions into place, stakeholders in cities are applying new forms of governance to improve access to good-quality jobs, build economic resilience, and connect isolated neighborhoods to needed resources. Information technologies can drive greater innovation if they explicitly address exclusion and are supported by sustained public pressure for more inclusive and open cities. Board of Governors of the Federal Reserve System. 2015. Report on the Economic Well-Being of U.S. Households in 2014. Washington, DC: Board of Governors of the Federal Reserve System. Capperis, Sean, Ingrid Gould Ellen, and Brian Karfunkel. 2015. Renting in America’s Largest Cities. New York: NYU Furman Center. Chetty, Raj, and Nathaniel Hendren. 2015. The Impacts of Neighborhoods on Intergenerational Mobility Childhood Exposure Effects and County-Level Estimates. Cambridge, MA: Harvard University. Dobbs, Richard, Ann Madgavkar, Dominic Barton, Eric Labaye, James Manyika, Charles Roxburgh, Susan Lund, and Siddarth Madhav. 2012. The World at Work: Jobs, Pay, and Skills for 3.5 Billion People. Washington, DC: McKinsey Global. Fry, Richard, and Paul Taylor. 2012. The Rise of Residential Segregation by Income. Washington, DC: Pew Social and Demographic Trends. Gebhardt, Dirk. 2014. Building Inclusive Cities: Challenges in the Multilevel Governance of Immigrant Integration in Europe. Grossman, Allen, and Ann Lombard. 2015. “The Role of Business in Collective Impact.” Stanford Social Innovation Review. International Labour Organization. 2015. Global Wage Report 2014/15. Geneva: International Labour Organization. Jargowsky, Paul A. 2015. “Architecture of Segregation: Civil Unrest, the Concentration of Poverty, and Public Policy.” New York: Century Foundation. Metropolitan Council. 2014. “Introduction to the Regional Solicitation.” St. Paul, MN: Metropolitan Council. Musil, Thomas A. 2014. “Developer/Community Contracts: The Emergence of Community Benefit Agreements in Real Estate Development.” Real Estate Finance 31 (1): 31–40. OECD (Organisation for Economic Co-operation and Development). 2014. "Poverty Rates and Gaps." In OECD Factbook 2013: Economic, Environmental and Social Statistics. 68–69. ———. 2015b. In It Together: Why Less Inequality Benefits All. Paris: Organisation for Economic Co-operation and Development. Piketty, Thomas. 2014. Capitalism in the Twenty-First Century. Translated by Arthur Goldhammer. Cambridge, MA: Belknap Press. Place/Matters. 2014. Engagement Technology for All: Best Practices for Using Technology in Engaging Underrepresented Communities in Planning. Denver, CO: Place/Matters, Ford Foundation. Regulatory Reform Team. 2015. Case Study: Chicago Licensing and Permitting Reform. Cambridge, MA: Harvard University Ash Center for Democratic Governance and Innovation, Data-Smart City Solutions. Spaulding, Shayne, and Ananda Martin-Caughey. 2015. The Goals and Dimensions of Employer Engagement in Workforce Development Programs. Washington, DC: Urban Institute. Tammaru, Tiit, Szymon Marcinczak, Maarten van Ham, and Sako Musterd. 2015. Socio-Economic Segregation in European Capital Cities: East meets West. New York: Routledge. Tosics, Ivan. 2015. Integrated Regeneration of Deprived Areas and the New Cohesion Policy Approach. URBACT. Solomon Greene is a senior fellow in the Center on International Development and Governance and the Metropolitan Housing and Communities Policy Center at the Urban Institute. His research focuses on how land use and housing policy can improve access to economic opportunity for vulnerable groups and how data and technology can improve city management and support more inclusive urban development. Rolf Pendall is director of the Metropolitan Housing and Communities Policy Center at the Urban Institute. In this role, he leads a team of over 40 experts on a broad array of housing, community development, and economic development topics, consistent with Urban’s nonpartisan, evidence-based approach to economic and social policy. Molly M. Scott is a senior research associate in the Metropolitan Housing and Communities Policy Center at the Urban Institute. In recent years, much of her work has focused on providing practical research support for nonprofits and local government agencies in planning, implementing, and testing innovative, place-based strategies to improve the lives of the ever-more-diverse low-income population. Serena Lei is a senior writer and editor at the Urban Institute. This brief was funded by the Rockefeller Foundation. We are grateful to them and to all our funders, who make it possible for Urban to advance its mission. The authors thank the Urban Institute team whose research contributed to this project and the findings reflected in this brief and related essays: Hamutal Bernstein, Eric Burnstein, Joshua Choper, Erwin de Leon, Liza Getsinger, Tracy Gordon, Reed Jordan, Pamela Loprest, John McGinty, Erika Poethig, and Jasmine Simington. We would also like to thank Rachel Korberg and Kevin O’Neil at the Rockefeller Foundation for their insights, feedback and support.